The party that came to power waving the anti-corruption flag is now involved in yet another scandal, in an effort to protect a minister who broke several articles of the penal code. Defense Minister Panos Kammenos had several telephone conversations with imprisoned businessman Makis Yiannousakis, who is serving a life sentence for being involved in trafficking 2 tons of heroin in Noor 1 ship. Yiannousakis was sentenced to life imprisonment in 2015. The convict has filed an appeal and is asking to be released from prison on the grounds that there have been two murder attempts against him and that his family is receiving threats. Furthermore, Yiannousakis has filed a suit against a port authority officer and a public prosecutor for blackmailing him to incriminate shipowner Vangelis Marinakis. In the suit he includes Justice Minister Stavros Kontonis, saying that under orders from the minister he was transferred to a prison that was not safe for him. Moreover, according to testimonies by Yiannousakis, in the past few months Kammenos has repeatedly asked him to incriminate shipowner Marinakis as being involved in the drug trafficking. Marinakis, however, was never charged of anything in regards to the case. The businessman claims that he has recorded the conversations he had with the defense minister. The last telephone conversation the two men had lasted 21 minutes. Several questions arise regarding the conversations between the defense minister and the convict: a) under what authority a cabinet member converses with a man who has been indicted two years ago and for such a serious crime; b) what was the content of the talks; c) who gave the convict a mobile phone in prison and how he was allowed to use it repeatedly; d) how did Kammenos know the convict had a telephone in prison and how did he get hold of the number. More questions arise after Kammenos’ act was exposed and he was forced to admit that he had spoken with Yiannousakis. The defense minister claims that the only reason he spoke to the convict was to urge him to tell the truth about the case, and that leads to more questions: a) is Kammenos unaware that judicial power and executive power are separate; b) does Kammenos question the rule of the Supreme Court that found Yiannousakis guilty and sentenced him to life imprisonment; c) what “truth” is he seeking two years after the trial; d) did he need to have several conversations, the last one being 21 minute long, just to ask for the truth; e) if he knew something about the case, why did he not come forward earlier; f) did he notify judicial authorities before becoming involved; g) does he trust and respect the Greek justice system; h) did he notify the prime minister of his initiative. Opposition parties brought the matter in parliament. New Democracy and the Democratic Coalition asked for a parliamentary investigative committee. 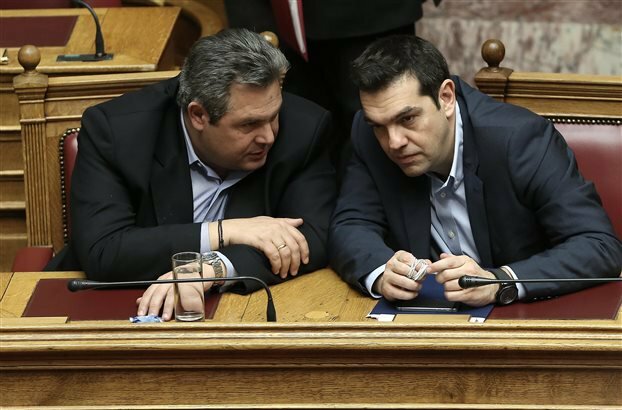 What is even more scandalous though is that Prime Minister Alexis Tsipras, Justice Minister Stavros Kontonis and House Speaker Nikos Voutsis found absolutely nothing wrong with Kammenos’ involvement in “cracking down the biggest drug case in Europe,” as Tsipras said in parliament. After cleverly avoiding to answer the question if he knew about Kammenos’ talks with Yiannousakis, he turned down the petition for an investigative committee. And the scandal goes even further. Tsipras, Kontonis and Voutsis, along with several cabinet members and coalition MPs, accused the opposition of trying to protect “criminal interests.” In other words, they implied that shipowner Marinakis is involved in the drug case. Tsipras, Kontonis and Voutsis acted as judges who have already found who is guilty of drug trafficking. Tsipras used, again, his populist tactics to cover up corruption in his administration: Slander and defamation. By branding the shipowner as a drug trafficker — without, of course, using his name or providing any evidence – he turns people’s attention from the real issue. His whole line of defense for Kammenos was that the opposition parties are linked with the shipowner and they attack Kammenos for their own gain. The prime minister was also protecting his seat. In any truly democratic country, Kammenos’ act would have been thoroughly investigated, at least. He most likely would have been deposed. In Greece’s case, that would mean that the fragile coalition majority would crumble. But then again the current administration has rarely showed much respect for judicial decisions, the constitutional separation of powers, or any code of ethics.